4 rounds at 100 yds inside a hole the size of a dime! I am a very satisfied 300 Win Mag customer. "I asked for a hunting gun and I got an IBS benchrest accuracy capable gun -- lol." With Accubonds my 300 RUM will shoot tight clovers all day." "First long range group was 1 1/2 inches @ 460 yards"
"Hey, Mister Len, I just wanted to call and say I am in love with my new gun!" "It's everything you advertise. Thank you, I will be ordering a big brother soon." "No problem getting 3/4 inches at 200 yards." "Very Sharp, probably the best looking rifle I've got. Also very little coppering in the barrel." "Len, I should have bought all my rifles from you." "This is how a custom built long range rifle should shoot"
"At 925 yards with a 6mph wind I put three rounds into a 4" group just to the right of the bullseye!" 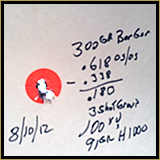 "My first shot at 993 yards impacted 1 inch high and 1 inch right of my aiming point. My second bullet divot in the granite rock touched the first divot." "With a 3 shot group it's hard to tell if we shot 3 times. With a 5 shot group all we need is a dime to cover it." 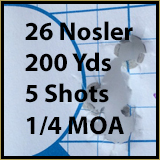 "My first 6 shot group at 100yds was just barely larger than a dime"
"I couldn't be happier with my 338 edge Rifle and when I look for my next long range rifle I may have to give you another email." "Scott said he had gotten out to 900 yards, putting 4 shots into 4 inches." "I just received my new long range 7MM Dakota from Len on monday. So far it has been every thing I had hoped for. After shooting 13 rounds through it cleaning between each round. 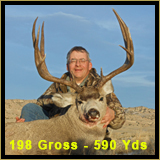 I shot a 3 shot group that measured .412 inches. " "My 338 EDGE rifle is a masterpiece of metal artwork & precision engineering. I am very impressed!" Best shooting rifle I have. 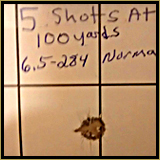 First 6 shot group at 100 yds was just barely larger than a dime. I had planned to sight in and do a 10 round break-in but when the third round hit point of aim I fired two more for group. 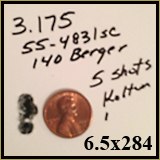 I now had an easy sub 1/2 inch group and I'd fired only 5 rounds through a brand new rifle! I'm starting to think about a big brother for this rifle you built me. I need to call you and pick your thoughts someday soon. 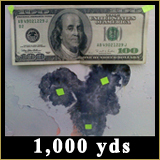 Thanks"
123 Amax 100 yards, 3 shots I think the rifle has potential! Thank you, again, for such a marvelous gun!